While many of us are battling with the slow data access and still awaiting the roll-out of 4G Networks, the International Telecommunication Union (ITU) is already looking forward to the next generation of telecommunication network technology. Yes folks, we are talking about the future 5G standard for mobile networking. Since 5G standard is currently in the definition stage, the ITU has announced a timeline for a name, demonstration, and distribution. What's the Standard Data Speed for 5G Network? 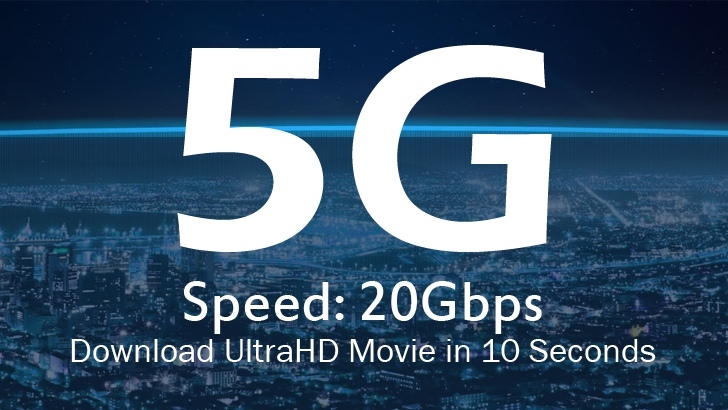 When I talk about data speed, the ITU has decided that 5G compliant networks will have to provide a peak data speed of up to 20Gbps, which means it's 20 times faster than the peak speed specification (1Gbps) of 4G LTE networks. For actual user speeds, this simply means a customer should receive an average Internet speed of between 100 and 1000 Mbps, which is somewhere between 10 and 100 fold increase over the typical 4G LTE speed of 10Mbps. So, soon in future, you may be able to download a full-length High Definition movie to your mobile phone in just a matter of seconds. Moreover, video chats with friends will be so realistic that you will feel like you can touch the other person right through your phones screen. Though 20 Gbps has been set as a standard data speed for 5G networks, security researchers from the University of Surrey achieved Record-Breaking data speeds with 5G wireless data connections back in February, achieving an incredible One Terabit per second (1Tbps) speed. The specification for 5G networks also serves future internet-of-things (IoT) technologies. 5G will have to provide up to 100 Mbps average data transmission speed to over 1 Million IoT devices within the radius of 1 Km2. "The vision for the 5G network and its global standardization schedule has been agreed based on our suggestion," a Korean Ministry official told the Korea Times. "This has shown that Korea is leading the world's mobile communications technology and related policies." The 5G network technology, which is still in the development stage, is expected to roll out between 2018 and 2020. As for the formal naming scheme, 5G Networks will be called IMT-2020, similar to IMT-2000 for 3G Networks and IMT-Advanced for 4G Networks. The final details for the 5G standard for mobile networking will be confirmed in October this year, following approval from the 193 International Telecommunication Union (ITU) member countries. Although an early demonstration of 5G network speeds will be given at the 2018 PyeongChang Winter Olympic Games, South Korea, according to Korean officials.